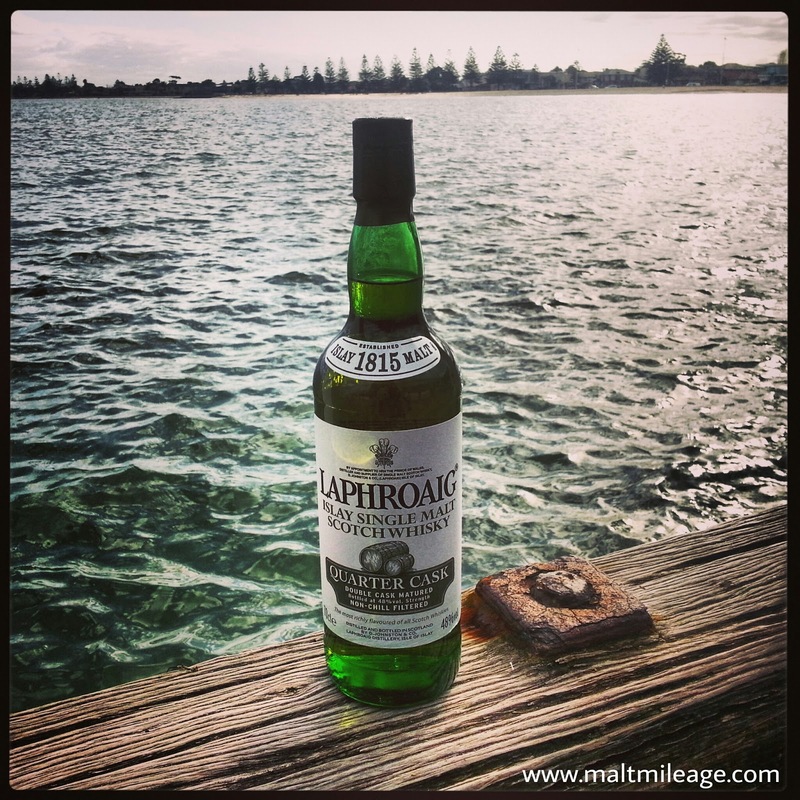 The Laphroaig Quarter Cask is the Isle of Islay in a glass, with gusts of Atlantic sea winds carrying exotic fruity and vegetal aromas that counteract the fiery “picante” character and peat as the silky vanilla infused American oak calms the assault of medicinal, iodine and maritime notes that tend to strangle the balance in many Islay expressions. Young whisky can be spectacular, and the epitome of young whisky at its finest is the Laphroaig Quarter Cask – a whisky that is aged for 5 years in American oak and then finished in quarter casks for seven months. That is barely 6 years old, but this young Scotch whisky boasts a fire and complexity that makes me want to leap out from my chair and hug a nearby oak tree that sits in a park near the beach. Laphroaig has been producing whisky for centuries, and many aspects of whisky making has changed, including the use of the quarter cask. This expression is the product of costly experimentation that sought to produce whisky the way it used to be made during times whisky was transported on horseback using small oak barrels. After some trial and error, including noting that the quarter casks were more aggressive than expected, Laphrooag have crafted a magical whisky that is turbocharged Islay perfection in a glass with a heavy American Oak influence. Increased interaction with the oak: Quarter casks allow the spirit to interact with the oak more than regular sized casks because there is more contact between the oak and the spirit, and this means that the spirit can draw out more of the lovely phenolic compounds in the oak and the previous contents of those American oak casks. Increased interaction with the air: The use of quarter casks does not just mean that there is more contact between the oak and the spirit. Because the quarter casks “breathe” just like regular casks, the increased surface contact means that the spirit can soak up more of the Atlantic sea air that blasts the storing warehouse at Laphroaig, which, apparently, sits only a stone’s throw away from the shore. Having tasted the Laphroag Quarter Cask, it is clear that a lot of care and skill has gone into crafting this impeccable whisky. Nose: The burning peat is softened by the coconut crusted lamington that released sponge, mild dusted dark chocolate and the aroma of vanilla. The sweetness is spearheaded by a surge of vanilla that rekindles memories of tropical fruit compote infused with a vanilla bean pod. This is very similar to nosing a half melted vanilla ice cream layered with a smoky Islay whisky and served in a wooden bowl. The barley also shines through the peat and sweetness with a distinct nutty earthiness and the bitter aroma of witlof leaves that are wilted under some oil. The American oak influence is certainly obvious! Taste: The surge of peat is interlaced with a spice attack of oil preserved sweet red peppers that ignite the palate with a burst of “picante” heat. The heat is then mellowed by the creamy oak influence that brings a piercing oakiness as a short firestorm of peat and wood spices electrify the taste buds with the medicinal burn of betadine doused with cream soda. Finish: The finish is pure Islay without an over the top beach theme, with smoky peat laden medicinal notes evapourating into a haze of betadine soaked band aids as the bitter witlof leaves and rubbing alcohol are counterbalanced by the fruity sweetness and big American oak notes. This is a seriously complex whisky with a heavy American oak influence that smooths some of the over the top Islay themes dominating the market, but at the same time complimenting a firestorm of peat laden magic! Superb work from Laphroag. The vanillas in the oak tend to dominate the nose a little too much, cloaking some of the other lovely Islay notes. This is the bottle that made me fell in love with whisky. Bold flavours that takes me to a smouldering campfire by the beach, lush.